Print the activity sheet out and hand out to the kids in Sunday school class or Children's Church. Have them cut all four pumpkins out and the four stems. 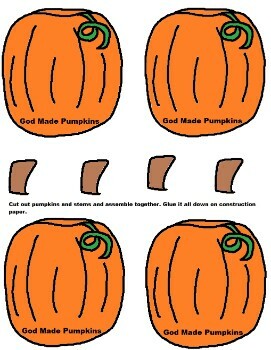 Give them a piece of black construction paper and a stick of glue to glue these pumpkins down. Have them add the stems to each pumpkin, Using a yellow crayon have the kids write the words, "GOD'S PUMPKIN PATCH" . Use this with our Fall lesson that is jam packed full of other stuff for the kids to do.